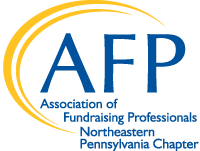 The Association of Fundraising Professionals NEPA Chapter mentoring program exists to provide chapter members with the opportunity for mentor/protégé paring. The objective of this initiative is to enhance and develop expert and quality development professionals in our region. As with any career, volunteer mentors offer guidance, care, compassion, professionalism and a level of excellence to help progress the protégés career and understanding of philanthropy in their chosen field of fundraising. To provide quality on-going educational opportunities for our membership. To strengthen the skills of the Protégé and support professional and career development by identifying and working on specific areas of her or his skills. If you would like to be paired with a mentor please contact Carol Maculloch at carol.maculloch@scranton.edu.